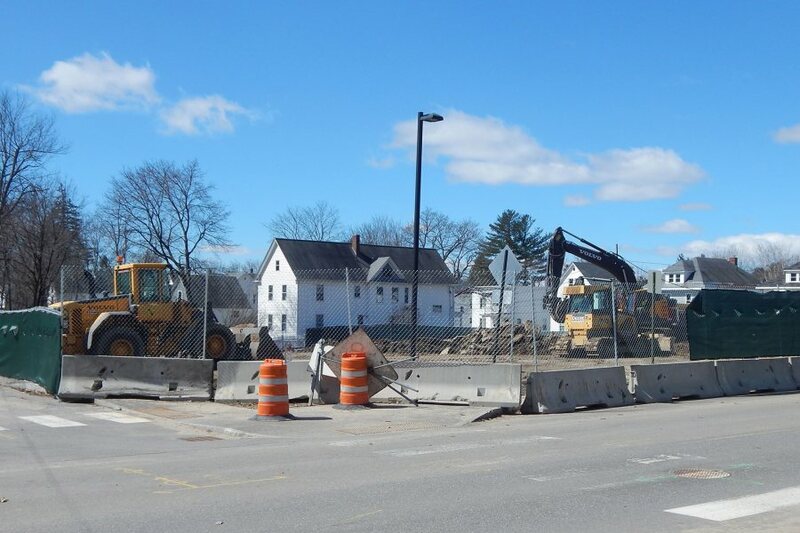 Campus Construction Update spent a few minutes on March 28 watching the obliteration of the houses in which we had worked until last fall: 141 and 145 Nichols St., the former home of the Bates Communications Office. On that sunny morning we were part of a small group that included, at various times, passing staff and students, the treasurer of Bates, BCO colleagues, Consigli Construction staff including Project Manager Stacey Harris, and Chris Streifel, the Facility Services project manager overseeing the creation of the Bates science building that will occupy the demolition site. The buildings came down fast, and our timing was not ideal. We pretty much missed the ruination of 145, where the college’s digital communications and design experts once were stationed. But we did arrive in time to watch a Gendron & Gendron Inc. excavator tamp the building’s remains into the cellar hole. Someone sprayed water over the debris to settle the dust as the excavator punched down the wood, siding, and wallboard. The demolition of 145 Nichols St., March 28, 2019. (Jay Burns/Bates College). The tamping gave the big Volvo a firm place to stand as it moved over to 141. Late for a meeting, we nevertheless stuck around for the start of that operation. It was hard to look away: not just because of our lingering attachment to the houses, but because the excavator made the formidable task of knocking down a building look like cutting an angel food cake. Mise en place: Here’s a geographical refresher: Opposite Carnegie Science Hall, the site of the new science building is bounded by Campus Avenue on the north; Bardwell and Nichols streets to the east and west; and along the south, a wandering property line. All that building demolition marked a crescendo, but not an ending, in the process of site preparation that had begun 10 days earlier as Consigli, the firm managing the construction of the science building, began mobilization activities at the site. Mobilization got off to a quick start. The site was fenced in by the 19th. Removing trees and brush began the following day and was nearly done by the 21st, with usable lumber salvaged for milling or pulping, depending on the type of tree. Excavators grubbed out tree roots and various pavements as solar-powered seismographs, placed near homes and buildings outside the site perimeter, monitored vibration levels. With the houses gone on the 28th, their remains joined the outflow of foliage, broken-up pavement, earth, boulders, and other unwanted materials that has kept a fleet of dump trucks buzzing around the site like diesel-powered bees. You could also liken this phase to the French culinary term mise en place, the practice of organizing your ingredients and tools before you cook something. But a key difference between the building project and making coq au vin is that Consigli and Gendron & Gendron, the subcontractor executing the site prep, are dealing primarily with dirt. So even before foundation digging gets underway, much of the existing soil is being removed and replaced with materials with known characteristics. And the terrain also needs to be contoured specifically for the project. Therefore, a lot of what’s been happening at the site is, in the simplest sense, just moving dirt around. In the southeast corner, across Bardwell Street from Chu Hall, a pit has been dug that, from now until the end of time, or for at least the lifespan of the science building, will handle unwanted rainwater from the site. Eventually the pond will be made over with appropriate soils and drainage infrastructure. Then there’s site access. The project began with a single entrance on Campus Avenue, introducing a lot of new traffic — dump trucks! — to an already busy thoroughfare. That entrance will see less and less use. A new gate has been opened on Bardwell, with another to follow on Nichols Street. A rectangular expanse between those gates, which will ultimately be the parking lot for the science building, will provide site access and space for gear and materials. That work is about half done. Last but not least in the mise en place department, one of these days Consigli will set up its portable field office on a grassy patch on Bardwell — the same location the firm used for the two years of the Chu and Kalperis project. Fixing a hole: The preparations for construction are all very interesting (we just have to keep rereading what we wrote about the drainage pond) — but we are pleased to point out that, probably by next week, actual construction of the science building will begin. In this phase, it’s “construction” in the sense of removing something rather than building something. Still, you have to start somewhere, and the science building construction will start with the excavation of a hole for its foundation. This project differs from other recent construction at Bates in that the hole will come very close to three sides of the construction site. As we explained previously, if there’s a lot of room around your cellar hole, you can give the sides a nice shallow slope to keep them from collapsing. Since that amount of free space doesn’t exist here, three sides of the hole will be shored up with corrugated metal sheets driven into the ground — temporary retaining walls. Ultimately, most of the hole will be roughly 15 feet deep. Some spots will go as deep as 20 in order to accommodate building systems that we’ll tell you about in a future CCU. Can we talk? Please send your thoughts about past, present, future, and speculative Bates construction projects to Doug Hubley. Please put “Construction Update” or “I have your Les Paul” in the subject line.